Co-author: Abby Moore (superhero theorist). 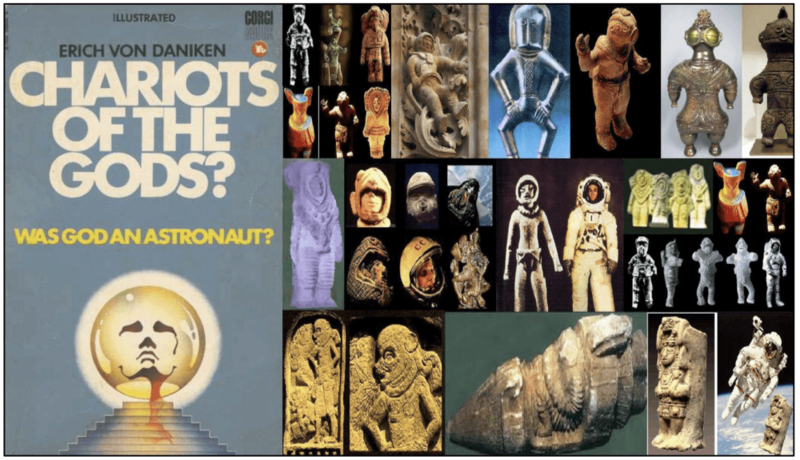 Are myths of ancient astronauts filling the voids left behind in the exodus from the myths of religion? Perhaps the popularity of the Ancient Aliens television series parallels the decline of traditional religious belief in 21st-century America. After all, twice as many Americans believe in ancient aliens visiting humans on Earth (35%) than believe in the pure evolution of human life on Earth (19%). Maybe TV shows about ancient aliens and Hollywood movies about superheroes provide the big cosmic narratives that once belonged almost solely to theology. Think about it: ancient aliens and superheroes both have superpowers once reserved for Gods, prophets, and miracle makers. For the record, I am an existentialist without the angst, influenced by Sartre, Sagan, and others. In a vast and ancient universe of two trillion galaxies and three sextillion stars stretching across 100 billion light years, I am not a cosmic narcissist who believes a Creator has a special plan for me or my species on a speck of a planet in a remote part of one galaxy. Yet, the cosmic vastness gives me hope that— to quote the astronaut Taylor (Charlton Heston) in Planet of the Apes (1968)— there has “to be something better than man. Has to be.” As explained in my most read essay in Medium, these better-than-human extratrerrestrials have never visited Earth (though I wish they would). Instead, we are witnessing the electronic birth of a new religion based in the myths and imaginary legends of extraterrestrial reality-TV stars—the “ancient aliens” who star in every episode, but have yet to appear. Much has been written about the decline of religious belief in 21st-century America, as documented in various surveys by the Pew Research Center. Americans who have no religious belief and/or no religious affiliation rose to 22.8% in 2014, up from 2% in the 1950s. While religious writers blamed the decline on the usual suspects (the breakdown of society, the decay of traditional values, and so on), the atheists and humanists tweeted their cheers of hope, apparently overlooking the possibility that a decline in traditional religious belief does not automatically equate to a rise in reason, science, and enlightenment. Given the increasing paranormalism in America, it could be the opposite. Make no mistake, something will fill the void. According to the United States Census, the current US population is an estimated 327 million people. If indeed 22.8% of Americans are non-believers, that total equals about 75 million people. Age is definitely a factor in non-belief. Over 33% of millennials claim no religious belief, while GenX non-believers are at 23%, Baby Boomers are 17%, and those born before 1945 are 11%. TABLE 1. Source: Pew Research Center website (2014); accessed November 11, 2017. According to Pew, about 50% of the unaffiliated are disenchanted with religion or don’t need religion because of their beliefs in “science” and the lack of evidence for a Creator. Another 20% have a beef against organized religion, while 18% are unsure of their beliefs and 10% are inactive. What’s most interesting to me is not the increase in atheists and agnostics, but the 15.8% who believe “nothing in particular.” 15.8% equals just over 50 million people. Since I doubt all of these people are nihilists, I wonder what they believe about the origins and destiny of the human species. Are they merely disinterested in religion? Have they outgrown religion, with no need to replace it with any other worldview or cosmology? Do they believe in evolution or that the observable universe is indeed 13.7 billion years old and contains two trillion galaxies? Do they believe in human-caused climate disruption or the Anthropocene? Do they believe we got here via the advice and interventions of ancient aliens? Or do mobile phones, cool threads, hipster restaurants, and Netflix subscriptions provide the needed daily dope—such that they do not need a cosmology for themselves or for our species? GRAPH 1. Beginning in the late 1960s, we can see the post-Apollo rise of the nones. Source: Gallup and National Public Radio, 2013. According to Gallup surveys and National Public Radio, the “nones” stayed below 5% until the Apollo program in the late 1960s. The rise of the nones began with the launch of rockets to the moon and continued long after the Apollo program was shut down. For readers who might not know, Apollo 8 orbited the moon in 1968 and took the famed Earthrise image, with Apollo 11 landing on the moon in 1969 and Apollo 17 marking the last journey to the moon in 1972. GRAPH 2. The post-1990 rise of the internet and rise of nones. Source: MIT Technology Review (“How the Internet is Taking Away America’s Religion,” April 4, 2014) and Allen Downey (“ “Religious Affiliation, Education, and Internet Use,” March 21, 2014). • Religious upbringing increases the chance of religious affiliation as an adult. Decreases in religious upbringing between the 1980s and 2000s account for about 25% of the observed decrease in affiliation. • College education decreases the chance of religious affiliation. Increases in college graduation between the 1980s and 2000s account for about 5% of the observed decrease in affiliation. • Internet use decreases the chance of religious affiliation. Increases in Internet use since 1990, from 0 to nearly 80% of the general population, account for about 20% of the observed decrease in affiliation. Please keep in mind that “correlation” does not equal “causation.” Correlations show patterns that we must connect to other knowledge, evidence, and observations. What Accounts for the Other 45%? Given there are 75 million non-believers, what other trends might account for the startling growth in numbers? If we follow Downey’s study and assume upbringing, education, and the internet can account for 55% of the increase, what else accounts for the other 45% (33.7 million people)? Is it the growth of the scientific outlook? That’s possible, given that only 9% of Americans believed in pure evolution in 1982 and the total has more than doubled to 19% in 2014 (according to Gallup). However, it is likely a good chunk of that 19% is accounted for in the 55% of Downey’s study? Could the increases be attributed to the various “New Atheist” books published in the past few years? Recent works include: Sam Harris’ The End of Faith (2004), Susan Jacoby’s Freethinkers: A History of American Secularism (2004), Richard Dawkins’ The God Delusion (2006), Daniel Dennett’s Breaking the Spell (2006), Christopher Hitchens’ God is Not Great (2007), and Victor Stenger’s God: the Failed Hypothesis (2007). These books might have had marginal influence on creating more non-believers, but my guess is that most of the readers of these books were already atheists. Plus, the sales of these books are dwarfed by the audience size of Ancient Aliens. As dramatized in 2001: A Space Odyssey, the monolith was the indisputable artifact left on Earth by advanced extraterrestrials. Ancient Aliens hijacked this concept and dumbed it down to the lowest possible level, while filling the intellectual void left by the death of philosophy long divorced from cosmology. Such a possibility is attractive, at least in theory. If ancient aliens have visited our planet, they would have possessed highly advanced sciences and technologies. They would have been viewed as gods, angels, and miracle makers by premodern humans, who would have looked upon the beings and technologies with awe, wonder, and fear. A 1970s-style Captain Kirk got in on the ancient alien narrative, too. Since Chariots of the Gods? was a huge best-seller, it was made into a documentary film, Chariots of the Gods (1970). Creator of The Twilight Zone, Rod Serling even narrated a one-hour TV version called In Search of Ancient Astronauts (1973). A copycat version of the film, Mysteries of the Gods, was released in 1976—hosted by none other than William Shatner, a.k.a. Captain Kirk, looking rather hip in a green turtleneck and black velour blazer, while sporting a 1970s-style toupée. With films and TV shows as publicity, Chariots of the Gods? sold over 40 million copies during the 1970s. Without a doubt, 2001, Planet of the Apes, and von Daniken’s book and films were trying to account for human origins and destiny at the pinnacle of the space age and the Apollo program. When I first encountered Chariots of the Gods? as a boy in the suburbs of Texas in the 1970s, it seemed like a plausible counter-narrative to the self-righteous evangelicals in my school and neighborhood. As explained here, I eventually began to question the validity of the assertions and realized the ancient-alien theory was bogus pseudoscience. To be frank, I was kinda bummed out. But, logic and evidence mattered more to me. Still do. Of course, there were mainstream media efforts to debunk Chariots of the Gods? These included a 1976 Skeptical Inquirer article, a book entitled The Space Gods Revealed that featured a forward by Carl Sagan, and a BBC-PBS production of Nova (the episode “The Case of the Ancient Astronauts”). Nevertheless, the book’s pseudoscientific ideas continued to circulate around the world in the decades that featured the rise of non-belief in the wake of Apollo. Given that Chariots of the Gods? sold 40 million copies, can we assume it had zero impact on traditional religious beliefs? In 2009, a two-part episode of Ancient Aliens appeared on the History Channel. So popular was the show that the History Channel programmed the Ancient Alien series, which began in 2010 and is still running every season—134 episodes and counting! As point of comparison for the atheist programs, Neil deGrasse Tyson’s 2014 Cosmos reboot only had 13 episodes and seems to appear on TV far less often than Ancient Aliens. I have seen both series listed in Netflix. Why would Ancient Aliens far outstrip Cosmos if the issue was merely a scientific outlook? The prime-time episodes of Ancient Aliens draw well over one million viewers, plus there are endless repeats during days and evenings. These audiences are far larger than anything on the Science Channel. Who knows how many millions of viewers have seen the various episodes of Ancient Aliens? Among the 45% and 33 million non-believers unaccounted for in Downey’s study, how many millions might be fans of Ancient Aliens? I don’t know but it is a question worth considering. I bet the total is far from zero. After all, recent surveys show that 35% of Americans believe aliens have visited Earth in the ancient past (see the Chapman surveys below). Still going strong almost 50 years after Chariots of the Gods?. The Ancient Aliens series features fanciful storytelling, with many scenes shot at the various remote sites where “evidence” of ancient aliens supposedly exists. Still, it’s all pseudoscientific nonsense—simply because there are no proven artifacts of extraterrestrial origin. There is no academic conspiracy against the ancient-alien theorists as implied in the narration and comments of the talking heads. What’s needed is proven evidence, as cleverly suggested by the monolith in 2001. But we haven’t discovered a monolith or the “chariots.” I wish we had. But the pseudoscience, endless fallacies, and alternative facts have not prevented the multi-season programming of the television series. Even if the History Channel decided against renewing the series, it would run for decades in syndication and for eternity online, at least until real extraterrestrials arrived or we finishing wrecking the planet. According to Chapman University, the belief in ancient aliens is growing rapidly: from 20% in 2015 to 35% in 2017. Chariots of the Gods? and Ancient Aliens have given birth to new cosmic religion narrative, with von Daniken as the great prophet and his followers serving as the scribes—Giorgio Tsoukalos, Graham Hancock, David Childress, and others. Like God and his prophets, the unseen aliens have superpowers and have shaped our past and perhaps our destiny, especially if they return. The ancient alien narrative is like the standard Creator narratives, in that it assumes most everything humans have done follows from pre-ordained grand plans, with mysterious or hidden purposes, effected by an all-powerful force from the sky, a force that has yet to return to prove it exists. Like the Creator narrative, we humans must have been special beneficiaries. After all, the ancient aliens have taken the time to visit our tiny planet, thus caring enough to allegedly build stone structures, design ancient batteries, create cool statuettes, and paint pictographs before cruising to the next galaxy or star system. Despite (or because of) the pseudoscience, the ancient alien theorists are doing a far better job of connecting humanity to the cosmos than Hollywood filmmakers and contemporary philosophers. The ancient-alien theorists have a fervant audience of followers who feel the theory connects our origins and destinies to the stars. Meanwhile, Hollywood merely sends us into space to wage Star Wars and battle Alien monsters. All of the above is why I predict the ancient-alien narrative will continue to grow over time, precisely because it is filled with mystical and magical beliefs that mirror religious mythologies. Ancient Aliens makes us feel special—just like Jesus, ETs came to visit us and advise us. After hijacking the 2001narrative, von Daniken and his scribes have built the ancient-astronaut theory into a new religion, a new cosmic narrative filling the void left by contemporary philosophy as it shrinks before a massive and expanding universe. Meanwhile, secular society provides us with mobile phones and IMAX movies, and says we and our tribes are special—so super-special that superheroes will save us in case the aliens don’t make it back in time. Born of Nietzsche’s 19th century “Ubermensch,” the superhero emerged to counter horiffic “supermen” of the 20th century — the Marxist New Man and the Nazi Aryan man. By the early 20th century, the Soviet Union promised to create the Marxist New Man, the new human supposedly liberated from capitalism and united via communism and “scientific” materialism, supposedly destined to operate on an international scale. Countering the Marxist New Man, Nazi Germany concocted a racist Aryan Man, a mythical superman from the past supposedly destined to rule Europe and much of the world. Of course, both of these visions of a “new man” resulted in genocide and mass slaughter in totalitarian societies, culminating in World War II and the deaths of hundreds of millions of people before, during, and after the war. In America’s land of a mythic “Democratic Man,” the only “superman” would be Superman, Batman, and subsequent legions of superheroes to save us in comics and movies. Though superheroes are fictional, their stories draw on real world events, such as nuclear weapons and environmental destruction. Superheroes function like secular gods providing stories about humanity’s survival and redemption in the face of apocalypse. In the end credits for The Avengers: Age of Ultron (2015), we see a giant sculpture of the Avenger superheroes, as if they are a pantheon of gods from Ancient Greece or Rome. Superhero films have proven especially popular in the 21st century, with a trendline that mirrors the rise of non-belief in America. Well into the 21st century, the superhero films just keep coming from Hollywood. Be it Superman, Batman, X-Men, Wonder Woman, or The Avengers, it seems almost all superhero films feature superheroes confronting a doomsday scenario for humanity. The superheroes must “save the world” because we can’t do it. Just as ancient-aliens fills the void left by philosophy divorced from science, superheroes fill the void left because industrial society has become divorced from nature, yet it is utterly reliant on the resources we are depleting. Oceans are acidifying, sea levels are rising, and nuclear war is still a possibility, while terrorism, exploitation, and endless tribal warfare plague secular society. Superheroes are needed to save us from ourselves because we know we have no answers, no real solutions for our problems, no leaders or institutions left to trust. It’s the same thing, over and over again, as illustrated in presidential elections. In the 21st century, Americans expect their presidents to be superheroes battling the doomsday scenarios of the other party—thus we give the presidents ever-expanded political and legal powers, as if we are trying to give them superpowers and make them into superheroes with super solutions. Both major parties do it. Don’t deny it. When the dictator arrives in America, it will be in the guise of a presidential superhero with political superpowers. As Trump has shown, the superhero prez won’t even need to be rational or coherent or even sane. They just need to be superheroes who zap the bad guys. This is what happens when religion and nationalism merge with Hollywood and the 24/7 media spectacle. In superhero movies and sequels, the superheroes must return to save us, again and again. Ancient-alien theorists claim extraterrestrial visitors shaped our past, present, and perhaps our future when they return. The return of aliens and superheroes echoes the promised return of Jesus and Nietzsche’s cycle of the eternal return, the superhero feedback loop. Ancient aliens and superheroes have superpowers beyond anything humans have, not unlike the Gods and prophets in religions. In the end, superheroes are our secular Gods and fulfill functions formerly reserved for religion, while ancient-alien theory claims to offer a secular narrative that connects us to the stars, yet ends up as another religion—a merger of the space age and new age. Superhero stories and ancient-alien theory now stand in for contemporary philosophy, divorced from 21st century cosmology and declared “dead” by Stephen Hawking. In the absence of a science-based popular philosophy that offers us hope, meaning, and purpose (beyond tribalism, consumerism, and strip-mining other planets) amid the cosmic vastness, the ancient-alien theory provides hope and meaning by connecting our origins and destiny to a story that begins in the stars—even it is in a universe of alternative facts. How much of the decline of traditional religious belief can be attributed to the rise of ancient alien theory? I don’t know, but given this analysis, I bet it is far from zero. This possibility is why the traditional religions will try to colonize the ancient-alien theory. Already, one prominent religious leader suggests we baptize extraterrestrials upon meeting them. If the ancient aliens do show up and don’t believe in a Creator, we might well need the superheroes to save us from a religious war in space! Barry Vacker is author of the new book, Specter of the Monolith (2017), which explores the meaning of Apollo and films like 2001 and Interstellar, while outlining a new and entirely original space philosophy for the human species. The book is available in Apple’s iBooks, Barnes & Noble (here), and Amazon (here). There Is A MASSIVE Underground Labyrinth In Egypt. Why Is It Kept From The Public?